Indianapolis, In. — Republican state senator from Oldenburg Jean Leising met with students from St. Louis Catholic School at the Statehouse recently. 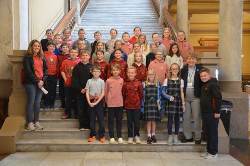 Students from Mrs. Jill Hollins and Mrs. Amy Weigel’s fourth grade classes toured the Statehouse and learned about state government and the role of a state senator.